Train season is upon us -- that glorious time of year when Parisians leave Paris in droves -- some of them on crowded roads, the lucky ones on trains. Time in trains means time in stations, which I feel compelled to tell (correct) you are not "gares" (rhymes with "fare"). They are "gares" (rhymes with "bar"). If you rhyme it with "fare" it sounds like you are saying "guerre" (meaning "war"). Nothing is more grating to a French person's ear than "Gayre" de Lyon. All of these beauties were designed, built, and inaugurated in the 1830 and 1840s -- the first, Gare St. Lazare, in 1837, and the last, Gare de L'est, in 1849. The Gare de Lyon was inaugurated in 1847, and renovated since, of course. The "Gayre" d'Orsay is a particular beauty, since it's been converted to almost inarguably (though if the current election season proves anything, it's that people can argue about some pretty ridiculous and seemingly objective things...) the foremost Impressionist Museum in the world. This is also the most recent, and least-used of the gares. It was built to bring people to the World Expo of 1900, and only operated till 1939. Though the timing looks suspect, it wasn't even the war that did in its usefulness, it was the fact that it had been built for shorter trains and by 1939 was mostly obsolete. It was used during and after the war -- first as a depot for sorting of materials in 1940 and after 1945 to receive French soldiers coming back from prisons in Germany. It was used as a suburban train hub for a little while then finally decided in 1977 to use the space for the museum, which opened in 1986. The Gare d'Orsay is said to have been the inspiration for the design of Penn Station in NYC (that is to say the original Penn Station, demolished in 1964, not the current one, as pointed out to me by a sharp-eyed reader living in NYC). I've talked about the price, efficiency, and comfort of the trains themselves, but I think the stations are also worth noting. I mean, they were good enough for Monet and Renoir and the other impressionist painters. They're good enough for modern painters, too. There's just something more romantic about a train station than an airport lounge. 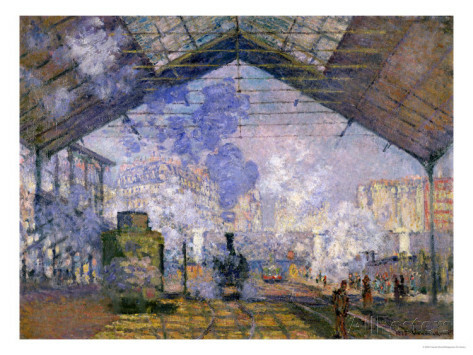 One of Monet's Gare St. Lazare paintings hangs, ironically, in the former Gare d'Orsay. A lovely woman named Michelle who heard my radio interview writes to tell me she wants to bring me a Kreuzig, a cheese from a tiny market in her tiny town at the western edge of Bretagne. I meet her in Gare Montparnasse (inaugurated 1840), where the trains come in from Normandy and Brittany: No coincidence that the surrounding area is filled with creperies. Michelle has seen my photo on my website, and thank goodness, because I am just standing there, waiting at the end of the platform of the incoming train for a stranger to deliver me cheese. It seems subversive and secretive, and I feel like I should be wearing a trench coat and fighting for the cause in World War II (but in this case, the cause is the pursuit of cheese). Even when I'm not receiving clandestine cheeses, the train stations appeal to me. There's usually good food to buy for train picnics -- both of the French pastry variety and sometimes even healthy/foreign -- and the occasional piano waiting to be played by passers-by. The big stations in Paris -- Montparnasse, Gare de Lyon, Gare du Nord, Gare de l'Est, Gare St-Lazare, and Gare d'Austerlitz are all, conveniently, a simple walk, bus, or metro ride away from my apartment (both old and new), and it's generally a breeze to get there on time, with just a little -- but not too much -- to spare. So much more civilized than having to show up 2-3 hours early for a flight. Kreuzig is a farmhouse, cheese made in Bretagne by one farmer from raw cows' milk. More specifically, it's made from the milk of the Pied Noir breed of cows, which is an unusual, small, local breed which produces less milk than other breeds, but creamier milk than other breeds. This makes for a tangy, rich, unctuous, velvety semi-hard cheese. Here's the cheese, sitting on the part of the map from whence it hails. It's got a sweet-sour taste to it and is a little odiferous without being outright smelly. It's a very unusual cheese, normally found only in the farmers' market in the local area, unless you also know somebody willing to bring you a hunk direct to Paris. While I've eaten the occasional slice of cheese in a sandwich bought at a train station, Kreuzig is the only slab of cheese I have actually procured at a train station -- wrapped in tin foil, direct from the market, delivered by a wonderful mystery woman named Michelle, fresh off the train. Wonderful post! I can't get enough history. I want to try that cheese, it sounds tasty.